My name is Matt Winick from Ann Arbor, Michigan with a strong interest in learning history and social justice. In these subjects, I like to learn the need to make Civil Rights stronger to reduce discrimination, have diversity to make society a better place for people with different background, and many others. 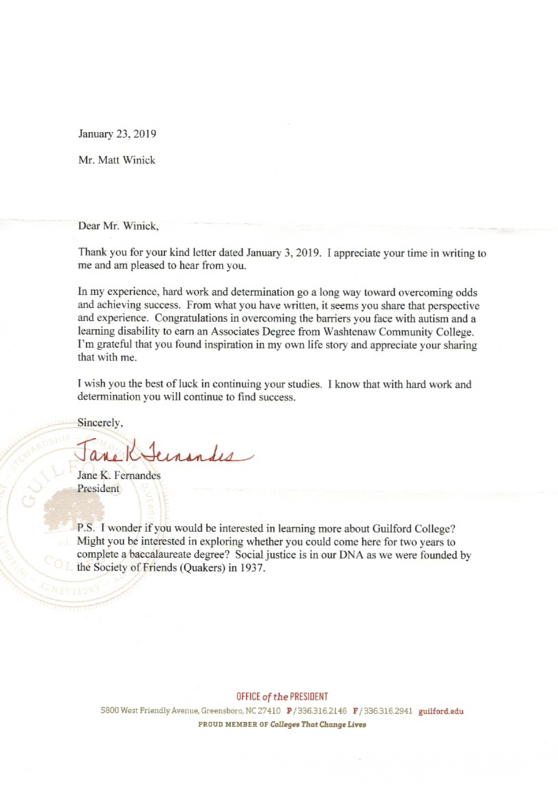 President Fernandes, the main reason I’m writing you a letter is to explain how I find your story about overcoming your disability and your work as 9th President of Guilford College to be very inspiring to me. In July 2014, I was amazed on how you made history by becoming the first woman and first deaf to become President of the Guilford College. I like on how you are a strong advocate for people with disabilities’ rights and support hiring women, minorities, and people with disabilities to work for the college. Expanded educational services to help people with different disabilities have accommodations to help assist them learn on different subjects like extra time on exams, have a note-taker help take notes, and more services of American Sign Language interpreters to help assist people who are deaf improve on communication with other people is a great way to help make colleges more welcome to people with disabilities. To improve education, I liked on how you are push for more diversity programs to help teach people about different cultures and push for more liberal arts, science, and history classes to make education diverse to learn. Another thing that I like about your work as President of Guilford College is how you support the need for immigration reform to help immigrants including refugees be protected including get an education from being oppressed, strongly advocate for Civil Rights, and work with student coalition groups to find ways to make Guilford College a better place or students to get a higher education. President Fernandes, I have autism with a learning disability since I was born. When I was in preschool through kindergarten I have “teaching time” where a speech therapist would work with me on developing speech including learning how to try to pronounce words. In my school years from elementary school, middle school, high school, and even Washtenaw Community College I still struggle with a disability, but was able to get help from special education including T.A. or tutors to help assist me on learning different subjects, have extra time on exams, and use educational resources with a recorder to help improve my comprehension. In May 2014, I was able to get an Associates Degree in Liberal Arts from Washtenaw Community College and in that degree my main focus is history, science, some business, some criminal justice, and government. Even though I completed my education, I still have struggles with a disability like fitting in with other people due to them getting judgmental about me being different from other people, when I work at a job I have difficulty understanding how to perform task at a fast pace or need more training, sometimes I have trouble communicating my thoughts, and learning different advance subjects. Your commitment to support Civil Rights including people with disabilities’ rights really inspires me to work hard on my disability. On Youtube I enjoyed watching “WGHP Newsmaker: Dr. Jane Fernandes, Guilford College President” because I liked learning about how you worked hard to overcome your disability on being deaf to becoming president of a college, how you work with an interpreter to help assist you to communicate with other people, and about your struggles on being deaf on fitting in with other people. Your story about your disability and working hard to overcome some of your struggles helps me to have faith in myself when I have difficulty with a disability. Also your role as President of Guilford College gives me motivation to continue to learn history with social justice. My future goal is to someday work in these areas to help emphasize the need to make Civil Rights stronger to reduce discrimination, the need for immigration reform to protect immigrants including refugees from being oppressed, and many others. I strongly believe that you are making a great difference for society. Even though you still struggle with a disability, I’m very proud on how you are working hard to make education, disabilities’ rights, and diversity a better place. Your story about being deaf, working hard to deal with a disability, and willing to work on improving society inspires me to work hard on my disability, be motivated to continue to learn history with social justice, and have faith that people with disabilities can be successful when I have struggles with a disability. I hope that you could please give me some advice to work hard on a disability when struggles gets too strong. Thanks for taking the time to read my letter, working hard to make a great difference along with work on making a difference when you have a disability, and inspiring me. I wish you the best to continue to make society, education, and people with disabilities’ rights a better place when the education system or political parties aren’t advocates for common sense ideas. P.S. You are a true inspiration to me and I’m proud to call you a great role model for me.